Central nervous system disorders are among the three major causes of mortality in neonates. All of the conditions that affect the infant's brain do so in part because this system is developing at a rapid rate. The neurologic examination of the newborn must thus be interpreted in the context of the child's brain maturation (gestational age) and level of alertness. The examination should be brief so as to avoid hypoxemia and fluctuations in arterial blood pressure. Head circumference is a useful measure of intracranial volume, and longitudinal measurements in particular provide important information. Observation of movement and symmetry can contribute significantly to the evaluation while minimizing the effects of handling, especially in the sick neonate. These observations should include any available assessment of the fetus in the intrauterine environment. Examination of the following cranial nerves is possible: 1 (olfaction); 2 (optic fundi); 3 (pupils); 3, 4, 6 (extraarticular movements, facial sensation and masticatory power); 7 (facial motility); 5, 7, 9, 10, 12 (sucking and swallowing); 11 (sternocleidomastoid function); and 12 (tongue function). Reliable assessment of cranial nerves 2 (vision) and 8 (audition) may require testing of auditory or visual evoked responses. Motor examination should include an assessment of tone and posture, motility and strength, and tendon and plantar reflexes. Primary neonatal reflexes including Moro's reflex, palmar grasp, and tonic neck response should also be considered. 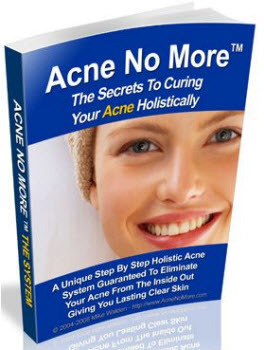 Although a sensory examination is possible, it is usually very limited and can be noxious. Because of the limitations of the neurologic exam and the complex support required by the sick neonate, frequently additional, usually non-invasive, neurodiagnostics will be required. These can include brain imaging (ultrasonography, computed tomography, magnetic resonance imaging, brain scan), neurophysiologic techniques (electroencephalogram, nerve conduction, electromyography), and cerebrospinal fluid examination. Figure 3.1. 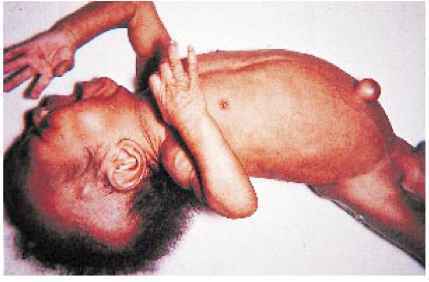 "Setting sun" sign in a normal newborn infant. The setting sun sign means that conjugate upward deviation is decreased. The upper eyelids are retracted and the irides are partly covered by the lower eyelid giving the appearance of a sunset. This is rarely observed as an isolated finding in an otherwise normal newborn infant. It may be normal if it is transient, but if it persists, it must be investigated. 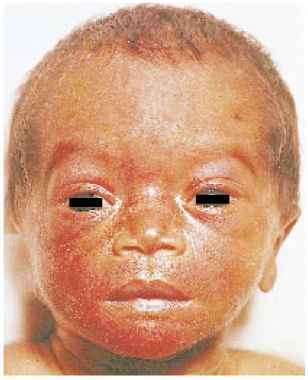 Note associated neonatal acne in this infant. Figure 3.2. 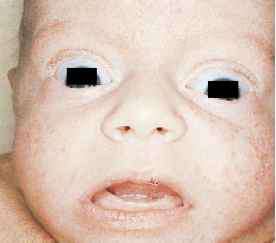 Persistent "setting sun" sign in an abnormal newborn infant. The setting sun sign is usually due to a lesion in the region of the quadrigeminal plate of the midbrain and signifies increased intracranial pressure. Increased intracra-nial pressure may result from hydrocephalus or subdural hematoma. It can occur in parenchymal or midbrain lesions, especially kernicterus. Figure 3.3. This premature infant with wide open eyes and a hyperalert expression continued to have an increased state of arousal, which is abnormal in the first hours of life. CT scan demonstrated a tentorial tear with hemorrhage. 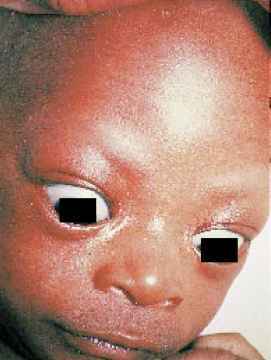 Hyperalert states may be the result of intracranial pathology or may be related to maternal drug ingestion. Infants with severe intracra-nial irritation may also have an anxious expression and furrowed brows. Figure 3.4. Opisthotonic posturing in an infant with congenital rubella encephalitis. Severe cortical irritation or damage may produce marked hypertonicity of the spinal muscles. The neck is hyperextended and the spine is arched. Note the flexed arms, fisted hands, and extended legs. Contractures may occur if the child remains in an opisthotonic posture. Figure 3.5. Marked hypotonia in a term infant with Lowe syndrome. Note that the infant hangs limply when supported in a prone position. 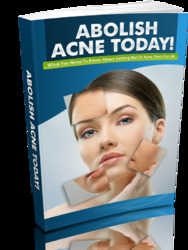 This Book Below Will Show You Exactly What What You Need To Do To Finally Be A Success With Abolishing Acne!